The Swiss EAGLE 4×4 Reconnaissance & Patrol Vehicle was originally developed by Swiss firm MOWAG for the Swiss Army. 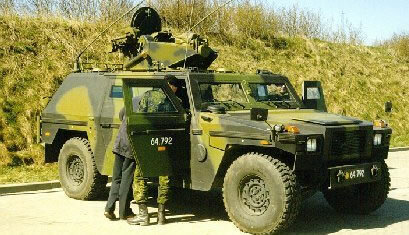 First orders were placed (now known as Mk I) in 1995 and since then the vehicle has been further developed in to other Marks. 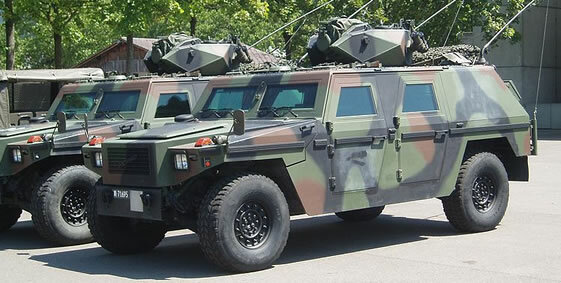 Developed on the same chassis as the US HMMWV it has a V8-cylinder GM, model LNA liquid cooled 159hp diesel engine. The vehicle provides an all-round 7.62mm MG protection as per level 1 STANAG 4569. Developed on the ECV (Expanded Capacity Vehicle) HMMWV chassis. This provides a higher engine performance as well as an increased payload carrying capacity (total 5500kg combat weight). This provided for a higher level of protection. These Marks are used in the Reconnaissance role, mounting a small one man turret with a 7.62mm MG thou they have removed in some cases. Developed on the ECV (Expanded Capacity Vehicle) HMMWV chassis. This provides a higher engine performance as well as an increased payload carrying capacity (total 5800kg combat weight). This provided for a higher level of protection. This Mark has been adapted with substantial improvements in communications and surveillance equipment (yet lacking the machine gun of previous versions) as a mobile artillery observer vehicle. Development of the vehicle started in early 2003. The vehicle is based on the Mowag DURO (DUrable and RObust) II chassis technology with roll stabiliser and the De-Dion axle system. The vehicle now meets STANAG 4569 level 3 protection and STANAG 4569 Level 2a mine protection (6kg TNT under each wheel). The vehicle uses a 6-cylinder Cummins, model ISBe 250, turbo charged, liquid cooled 312hp diesel engine. The vehicle can carry an additional passenger as well as a Remote Weapon Station. The latest mark, has permanent all wheel drive and a modular protection system giving a very high level of protection against ballistic threats, mines, and IED’s. Its equipped with air conditioning and NBC overpressure systems. Originally operating the Mark I, these have been replaced with Mark IV and 91 are in service as in the Reconnaissance/Patrol role. 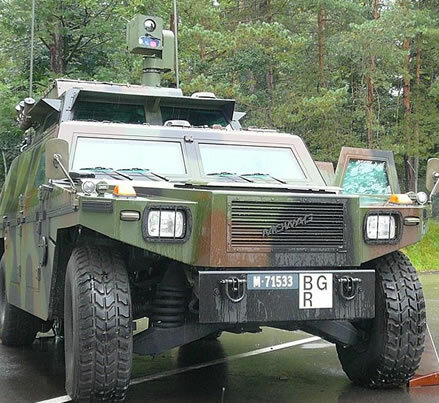 Like the US MRAP program, the Bundeswehr have been running their own protected vehicle procurement program called GFF, which is an acronym for armoured command and multipurpose vehicle. Models are divided into four categories: the lightweight, 5.3-ton GFF 1, the 7.5-ton GFF 2, the 12.5-ton GFF 3 and the 25-ton GFF 4 all-terrain utility vehicle. The Eagle Mark IV has been selected for the GFF 2 category in 2008 as part of orders for 473 vehicles. The Eagle BAT is an ambulance version which accommodates an emergency doctor, rescue assistant and a driver/paramedic and allows patient transport and emergency treatment while protecting occupants from ballistic threats, mines and improvised explosive devices. 20 vehicles were delivered as part of a later order on top of the original 473 Reconnaissance/Patrol role vehicles in early 2011 and in April 2011 a further order for another 20 was placed. In June 2013 and in February 201 4the Bundeswehr acquired further 176 EAGLE V.
A total of 329 Eagle I and II are in use as light armoured reconnaissance vehicles (Aufklärungsfahrzeug), armed with a 7.5mm Pz Mg 51/71 machine gun and fitted with thermal imaging and radio equipment. They are known respectively as Aufklärungsfahrzeug 93 and Aufklärungsfahrzeug 97. 120 Eagle III have been acquired as mobile artillery observer vehicles in 2003. MOWAG, originally MOWAG Motorwagenfabrik AG, was founded in 1950 as a privately owned company in Switzerland. Since October 2003, MOWAG has been a company within the General Dynamics European Land Systems group who now market the vehicle as “EAGLE”.